This plant is blooming four times a year. With flowers about 7 to 10 flowers that are 5 inches across. This is also my most requested plant. We hope to have plants growing but this one takes a while in flask. "We are growing for you." In our local area and yours you can find many wild orchids. Please take the time to look around while you are enjoying the creations of God, and while walking, look for orchids. If you come across a wild orchid please get a map and put a mark on it and photograph the plant and send it to us. Let us know when you have found one and we will e-mail you our address. We will pass the information along to have it documented, identified and listed. PLEASE keep the orchids in their natural homes and visit frequently and keep a log of growth if possible. This will be the best way to keep them from disappearing. Enjoy them by pictures and video. The following pages have some information that you will find helpful. I have tried to get you enough information to help you out. If you would like to have more information please see the links or feel free to e-mail us and we will see if we can help you with your specific need. Let us know the name on the tag of your orchid as well. This could help us separate the specific plant from the general items. I have tried my hand at flasking so I have added a new page with flask information as well. If you are looking for a particular plant, click on our e-mail address and let us know the plant and we will send out a note to growers all around the US for you to help find it. If you are a grower and would like to be added to my list please contact me. 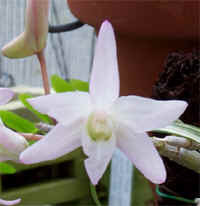 Find out about veri-color leaves of Dendrobium moniliforme click on the Japanese character. Critters we have found in the greenhouse. SO WHAT DO LADYBUGS HAVE TO DO WITH ORCHIDS?? Click on the lady bug and see!